I’m getting into Christmas gift mode. I feel like I’ve been crocheting constantly for the last week or so. Most people on my list will be getting handmade simple scarves. Don’t tell on me but I’m pretty lazy about the whole thing. I thought I’d share my old stand-by plan for super easy scarves. It all started a few years ago when I was in college. I made an amazingly fluffy blue scarf, it got lots of compliments and I had people asking me to please make them one. 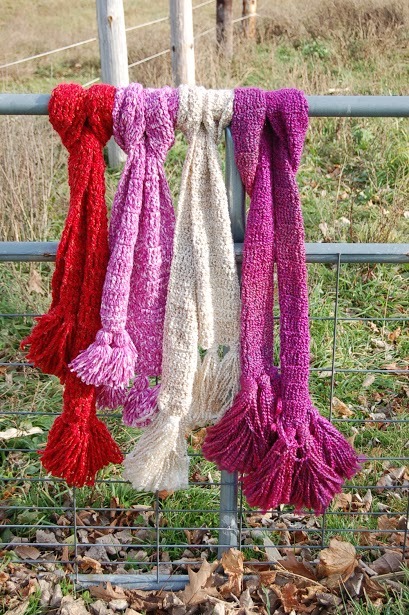 I think practical and thoughtful homemade gift are always a safe bet so I ended up making piles of homemade scarves. Before we start you should know that I can’t handle complicated patterns. That’s also why I don’t knit (and because my left hand doesn’t cooperate and remembering the difference between a knit and a purl is so far beyond me it’s not funny). This is literally the easiest ‘pattern’ you’ll ever see so buckle up buttercup and prepare to be amazed. This is without a doubt the hardest part. My preferences are: on sale, pretty and chunky. Look for variegated or multicolored yarns, they make the simple scarf pattern look a little fancier with no extra effort from you. On the side of the yarn wrapper you’ll see a box with a number. Look for a 5 which means Chunky. 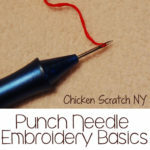 It’s a thick yarn, which means you can use a bigger hook and the whole thing will go more quickly. Because not only am I incapable of remembering a pattern, I’m also impatient. You’ll find another box in the same location with the recommended hook size. It’s a guideline but it will give you a place to start. I’m a very loose crocheter so I usually move one hook size down. Ok, really I use whatever I have handy. I’m setting a terrible example here. And don’t forget, done is better than perfect. I had some trouble with the orange and pink scarf but my kid doesn’t know or care. She’s just happy to have a bright, happy scarf with fluffy tassels. You’d never know it from the pictures. 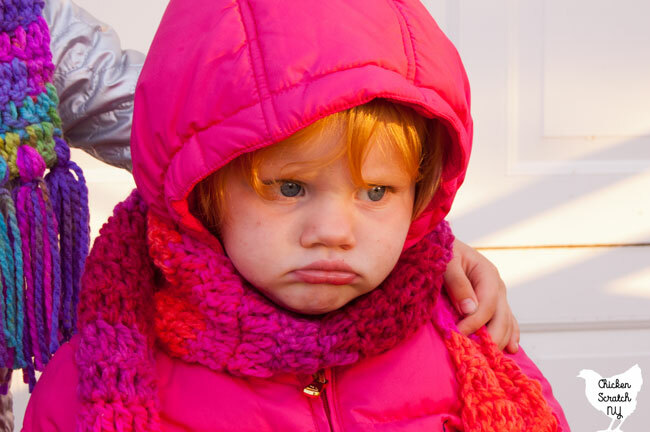 Terrible two’s hit hard earlier this week. This ‘pattern’ assumes you know basic crochet stitches, all you need here is a chain and a double crochet. This page explains a double crochet much better than I could. So.. That’s the pattern. Do you feel cheated? You shouldn’t, you didn’t pay for it. This is the yarn I used for my daughters scarves shown here. I have mixed feelings because while I loved both colors they were not consistent. 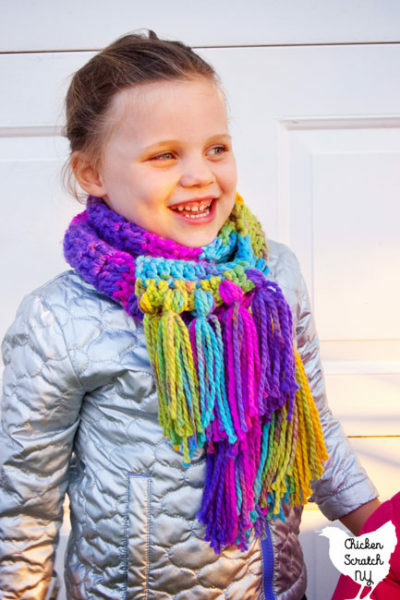 The rainbow yarn is the color Passion and it’s perfect for this project. I used a whole ball for Mary’s scarf, used the second to make her tassels and a matching doll scarf. Then we get to Bright Pop, the variegated orange and pink. I went right along with my regular pattern, 10 double crochet stitches per row. Then I compared the two and noticed Kat’s scarf was much longer and I still had yarn left. Looking closer I realized the Bright Pop yarn was much thinner than than the Passion yarn. Had I noticed before I would have moved down a hook size and it probably would have made a nice scarf. It’s too late for me, but not for you. If you pick up a few balls of Charisma yarn from Michael’s (and you should, it’s constantly on sale for $2.50) check out how thick it is. The label recommends an L or 8mm hook, I used a J (6mm) and still could have gone smaller for the orange and pink scarf. 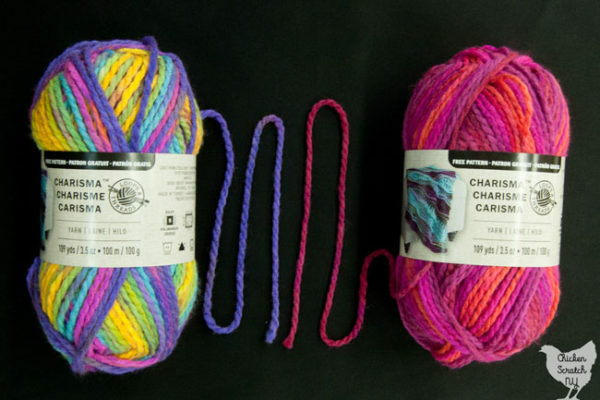 This is the yarn that started it all. My super fluffy blue scarf of is made from Homespun (Montana Sky). I used Mixed Berries and Pearls for the Christmas Scarves. One skein makes a decent scarf. I used half-double crochet for the white one, the scarf ended up being quite a bit shorter. The downside is the colors are pretty limited and the yarn is on the expensive side for me. I found it cheapest at Michael’s on sale for $4. Regular price at Joann’s was around $7 dollars. It also sheds like a Golden Retriever in the spring. If you’re making tassels with this be prepared to tie a knot at the end to keep them from unraveling or keep a lint roller handy! I’ve only made some scarf from this, it crocheted really easily, sometimes with nubby yarn you get the hook stuck in the yarn, didn’t happen with this one. I used the Hollyhock color, a really pretty true red with golds in it. I wasn’t crazy about it before I crocheted it but the color really came out once it was in scarf form. There are lots of pretty colors, I’m thinking I might need one from Solarium color. 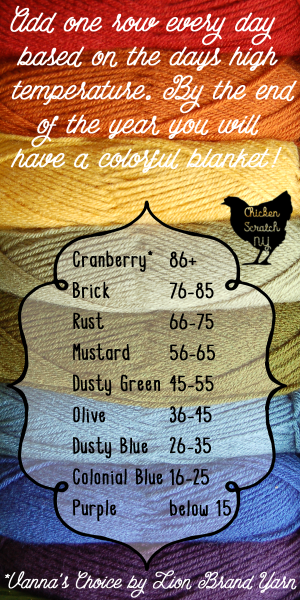 This made a thicker scarf than the homespun which was nice for the frigid winters here in good old CNY. Only available at Michael’s, it’s been on sale the last few times I’ve been in. 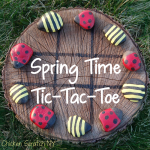 Don’t forget to PIN this to your Crochet Board! I haven’t crocheted in years, but I guess it’s like riding a bike. It really is! I haven’t crocheted in almost a year, I admit I had to rip out a few rows but it comes right back. I didn’t even think about tassles and stuff. What a fun addition!! Hey, thanks for posting your lovely scarves. I have friends who are beginner crocheters. They need to see how cute simple can be. Especially love the fat tassles! I love these! 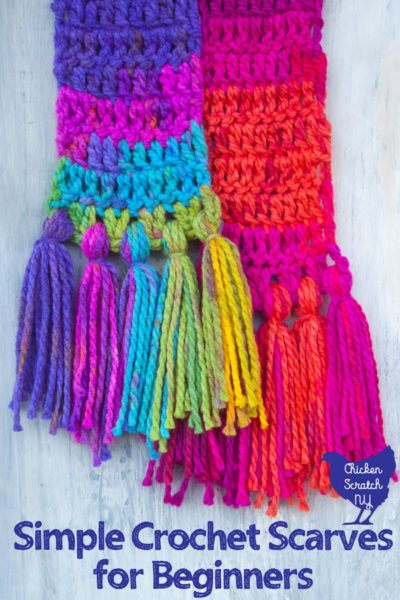 How do you make tassels? What size crochet hook did you use? Can you do this on a loom as well? How did you finish with the balls and tassels at the end? I never mastered using a loom for anything by hats, so I’m not sure on that one. I probably used a K, if not something right around that size range. For something like this where size doesn’t really matter I grab whatever hook I can find in the general size that I want.